Nearly 14 million Australians now have access to some form of pay TV/subscription TV, up 11.8 per cent on a year ago new research by Roy Morgan has found. And it’s not just Netflix driving the increase with large year-over-year increases for several SVOD services including Netflix, Stan, YouTube Premium and Amazon Prime Video. 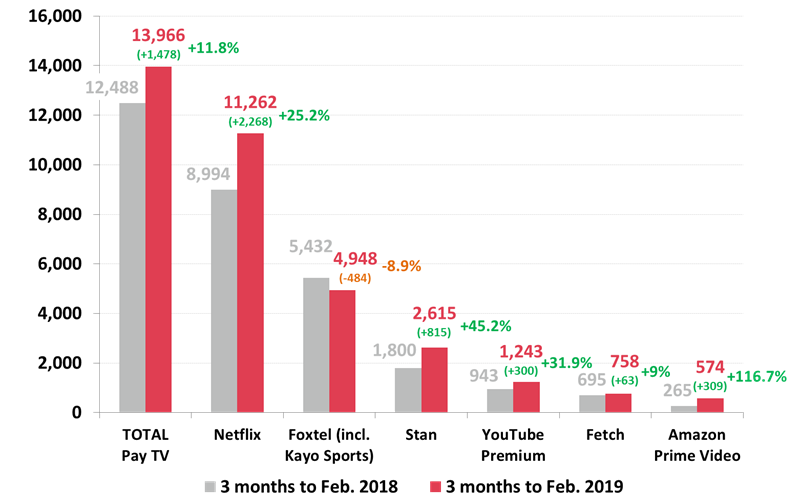 Over the last year Netflix has continued to lead the growth of Subscription Video on Demand (SVOD) services with over 11.2 million Australians in the three months to February 2019 now having a Netflix subscription in their household, up by 25.2 per cent on a year ago. The leading Australian-owned SVOD is Stan which is now accessible by over 2.6 million Australians up an impressive 45.2 per cent on a year ago. YouTube Premium (formerly YouTube Red), now has over 1.2 million users, up 31.9 per cent on a year ago and Fetch now has nearly 760,000 users, up by nine per cent on a year ago. Commenting on the findings Roy Morgan CEO Michele Levine said: “Pay TV/Subscription TV services are an increasingly competitive marketplace in Australia. Going forward the battleground will be content and cost. To charge for a service there needs to be unique valued content e.g. live sport. Just this week we have learned that Australia’s leading football code the AFL has been approached by well-known global streaming giants about acquiring the rights for the AFL when the next rights deal begins in 2023.